After 25 episodes on Facebook Professor Speaks expands to the YouTube Live Platform, with a new host. 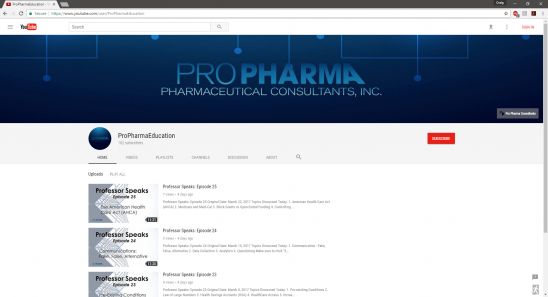 CANOGA PARK, Calif. - April 11, 2017 - PRLog -- On Wednesday, April 12th, 2017 at 12:00 pm (PDT) Pro Pharma will be broadcasting its first Professor Speaks YouTube Live video on "Pro Pharma Education" channel, hosted by Alex Hernandez with commentary from Dr. Craig Stern. Professor Speaks was originally created in 2013 by Dr. Craig Stern and ran for 30 Episodes, which featured topics such as: Healthcare Trend, Evidence Based Medicine, Generic Medications, Types of Formularies, and Specialty Injectables. "The series was originally created because we were seeing a gap in the industry. Clients would have questions that were not being addressed or were not well understood by other sources," states Dr. Stern, President of Pro Pharma Pharmaceutical Consultants, Inc.
After an extended hiatus, Professor Speaks returned, and this time it was LIVE. On August 15th, 2016, the second iteration of Professor Speaks premiered on Facebook Live. "We want not only to educate the public but also create a conversation, Facebook Live allowed us to do exactly that," states Carol Stern, CEO of Pro Pharma Pharmaceutical Consultants, Inc.
With the second iteration, currently in its 25th episode, this weekly video series will be broadcast live not only on Facebook but on YouTube as well. "We are so excited with the positive response we have gotten with these videos and want to make these videos available, as an educational tool, to as many people as possible. YouTube Live, is the best platform for that," said Mireira Moran, Project Specialist for Pro Pharma Pharmaceutical Consultants, Inc.
With this expansion, Pro Pharma is pleased to introduce Professor Speaks' new host: Alex Hernandez. Mr. Hernandez is a Data Analyst with years of experience in the pharmaceutical industry. He comments, "I am honored to be a part of Professor Speaks. I look forward to bringing a new, and hopefully, unique perspective to this excellent series. To learn more about Pro Pharma's Professor Speaks please contact Pro Pharma at info@propharmaconsultants.com, call (888) 701-5438 or visit the website at http://www.propharmaconsultants.com. Pro Pharma is a multi-service, woman owned, privately held consulting firm offering a vast portfolio of services to public and private entities including self-insured employers, unions, public employers, for-profit hospitals and integrated health networks, health care insurance companies, worker's compensation insurers, small-to-medium sized HMO's, and physician groups. : Pro Pharma Pharmaceutical Consulting, Inc.